Sayuri Honda (Miki Nakatani) claims she has no interests in love affairs. She refuses to take things as they are for she fancies her harbor town of Nagasaki as Lisbon, Portugal. But on Christmas, encouraged by the season of romance, she tries to materialize her once-in-a-lifetime love with the man of her dreams. Movie was filmed in Nagasaki City, Nagano Prefecture (Shinshu University auditorium) and Lisbon Portugal. 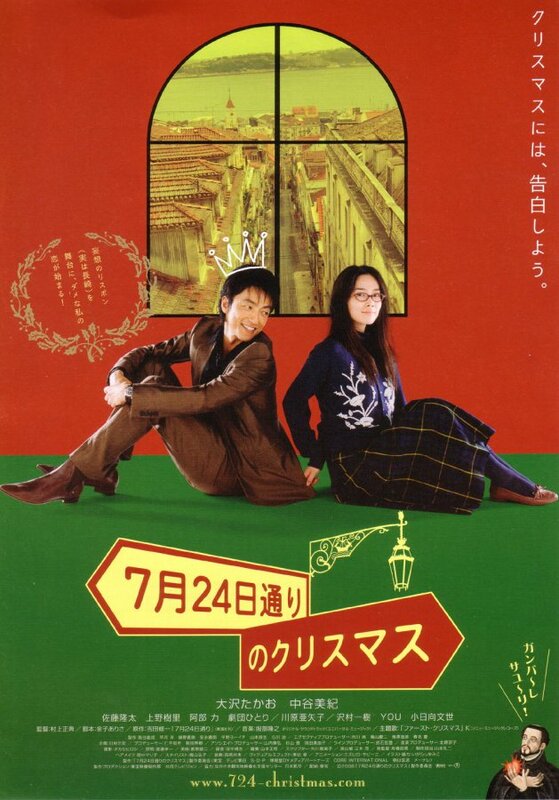 Ki Jan 09 2009 1:16 pm I hate to sound like the Scrooge but when it comes to “Christmas On July 24th Avenue” I would have to say “Bah Humbug!” The movie certainly seemed promising with two appealing leads, Miki Nakatani and Takao Osawa, cast in a Christmas themed romantic comedy. Furthermore the supporting cast features some excellent actors such as Juri Ueno, You and Hiraoka Yuuta. The movie was also created by the same folks responsible for Train Man : Densha Otoko (Director Masanori Murakami & Screenplay writer Arisa Kaneko). With all these talented folks gathered together the movie was surprisingly a dull borefest. Problems were many, but the biggest problem would have been the creators of Train Man : Densha Otoko trying to recreate the success of that movie by using the same formulaic setup. Most notably in Train Man you had an incredibly timid boy falling in love with a well balanced and beautiful girl. In Christmas on July 24th Avenue you have a similar setup except the genders are reversed, the girl this time around is incredibly and timid and the guy is more well balanced and popular. Miki Nakatani was cast in Train Man as the main love interest, comfortably suited to play the graceful Hermes. This time around she gets to play the other side, performing as the shy & timid Sayuri. Her performance wasn’t convincing and felt awkward to watch. Make no doubt that Miki Nakatani is one attractive lady. She has a beauty that at times recalls such screen legends like Audrey Hepburn or Sophia Loren. Yet the filmmakers in Christmas on July 24th Avenue felt that a pair of eye glasses and a hairdo straight out of Memories Of Matusko would transform this beauty into an unattractive book worm. Miki Nakatani was also guilty of overacting in trying to portray the timid and clumsy Sayuri. Not believable in the least and annoying to watch. Her co-star Takao Osawa didn’t help much either. He provided as much charisma as a static shot of a while wall. Unlike Crying Out Love, In The Center of The World where the movie was good despite Takao Osawa’s dull performance, Christmas On July 24th Avenue needed a charismatic male lead and Takao Osawa just wasn’t capable of filling that duty. Nice enough stiff..but how dull! Luckily the supporting cast was much better and way more interesting. My favorite would have been Juri Ueno and her portrayal of Megumi Kamibayashi aka Fir Tree. Juri Ueno was charming, intriguing and unrecognizable in her performance, something Miki Nakataini should have been but failed to do. Other recognizable names and faces would have been You (Nobody Knows) who played the girlfriend of Sayuri’s father. Although her role was small, the scenes were she teased Yoshio was great stuff. Ryuta Sato, who played Yoshio, was also very good in his supporting role. The little animated cartoon he drew in one of the books for Sayuri was precious. If you blinked during the beginning portions of the film you may have missed it, but Hiraoka Yuuta of Swing Girls fame makes a brief cameo appearance as the young man that Sayuri bumps into on the street. On the positive side, there were some interesting special effects interwoven into the film to brighten things up. The CG created crowns over Sayuri’s princes were nice touches. Animated flowers blooming behind Sayuri were also pleasant to view. What wasn’t pleasant to view were the two imaginary Portuguese characters that would recur throughout the movie. Not very funny and annoying to see. In retrospect, Christmas On July 24th Avenue should have been so much better. The way the filmmakers attempted to recreate Train Man : Densha Otoko into a Christmas themed romantic comedy felt forced and unappealing to watch. Miki Nakatani was miscast in the movie, perhaps if Juri Ueno was cast in the lead role the movie would have fared much better. Takao Osawa was a pure stiff in his role as the male lead. A few nice touches with the visuals and a strong supporting cast is what saved the film from being a total bomb. If you’re in the mood for Holiday themed romantic comedy than look elsewhere.